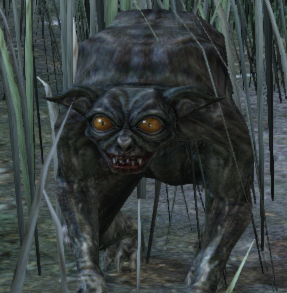 Prowler Hound is an enemy in Dark Souls 2. These skittish, dog-like creatures inhabit the small meadow near the Fire Keeper's hut. Are these the Fire Keeper's pets, or simply a form of life native to the limbo that exists between Drangleic and the outside world? For the ones in Things Betwixt: I found it best with a weapon that has a good AOE in front of the players character and without locking on. These do not drop anything. Only the ones in Aldia's Keep drop what is found on the loot table. Just kill one and run to a place where there is no grass to hide. Aim your camera perspective on the floor in front of you and just hit them like that until all are dead. - Kobolds in Aldia's Keep can petrify. You wanna tell me these little bastards drop some of the best weapons in the game? Please, someone explain.